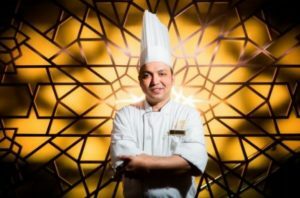 Macao (Macao SAR) – December 11, 2018 (travelindex.com) – For the sixth year in a row The Venetian Macao’s superlative Indian restaurant The Golden Peacock has again been awarded a Michelin one-star rating as “high quality cooking, worth a stop”. The Golden Peacock is open daily 11 a.m–3 p.m. for buffet lunch, with newly introduced daily live cooking station featuring regional Indian street food and full à la carte menu available from 6-11 p.m.
Will The Golden Peacock make it into the Top 25 Restaurants in Macao, the Mastercard Affluent Dining Guide by Travelindex and the trusted Restaurant Rating Index? Opened in 2007, The Venetian® Macao is Macao’s first integrated resort featuring stunning replicas of the famous canals and architectural icons of Venice, Italy. The Venetian Macao features 3,000 suites, 1.2 million square feet (111,000 square metres) of convention and meeting facilities as well as a 15,000-seat Cotai Arena designed for world-class sports events and electrifying entertainment. The Venetian Macao is also home to the unique, 1,800-seat luxury Venetian Theatre, hosting the best in international and Chinese entertainment; more than 30 renowned restaurants; the incredibly fun QUBE indoor playground and more than 350 retailers at Shoppes at Venetian. Outdoor recreation areas include swimming pools and cabanas and a mini-golf course.